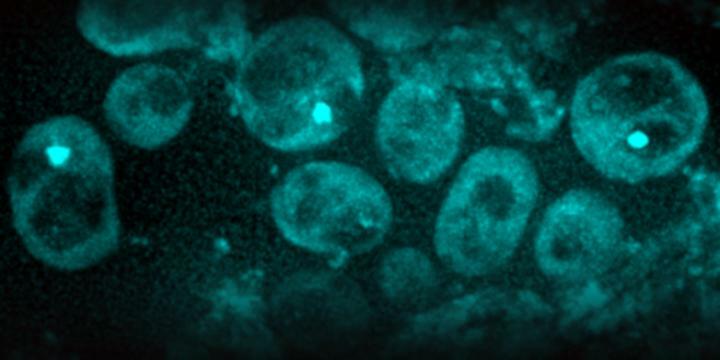 IMAGE: Scientists found in yeast cells protein aggregates (light green spots). As cells age and divide, these aggregates become more frequent (micrograph). We age because the cells in our bodies begin to malfunction over the years. This is the general view that scientists hold of the ageing process. For example, in older people the cells’ internal quality control breaks down. This control function usually eliminates proteins that have become unstable and lost their normal three-dimensional structure. These deformed proteins accumulate in the cells in a number of diseases, such as Parkinson’s and Alzheimer’s. For Yves Barral, Professor of Biochemistry at ETH Zurich, the view of the ageing process as a consequence of flawed cell function and disease is too narrow. It ignores the fact that the mentioned so-called prion-like protein accumulations could have a positive effect, too, and therefore should not be referred to as cellular malfunction, he says. The scientists assume that these age-associated aggregates are formed by several different proteins. The researchers have already identified one prion-like protein that is part of the accumulations. What other proteins are involved and why the aggregates remain in the parent cells during cell division are subjects of further research. Only in recent years have scientists speculated that aggregating proteins in the cells can generally play a positive role. Barral and his research group showed back in 2013 that yeast cells memorise experiences related to unsuccessful sexual reproduction attempts in the form of aggregated proteins (see ETH News from 05.12.2013, https://www.ethz.ch/en/news-and-events/eth-news/news/2013/12/protein-clumps-as-memory.html). These aggregates – which are not identical to the newly discovered age-associated accumulations – thus serve as molecular memory for yeast cells. Even in mice there is a positive relationship between prion-like aggregates and memory. A few months ago, American scientists demonstrated that mice with such accumulations in their nerve cells exhibit a more stable long-term memory. Whether such age-associated protein accumulations are primarily a malfunction or a normal function of healthy cells is for Barral a scientific question – one in which philosophy also plays a role: “Our western society understands ageing as something that is predominantly negative, a disease that has to be combated,” he says. “This thinking is reflected in the work of many scientists, whose research on ageing focuses on finding defects in cells.” Other societies, however, place more value on the positive effects of ageing, such as increased experience and knowledge – a view that corresponds with the newly discovered role of aggregates as information storage or memory for cells.